It’s coming up for Christmas and it all feels a little manic on the run up to the big day. So I thought I would do a review of my top 10 female entrepreneur business books that I’ve read this year. The best part is you still have time to order them in time for the Christmas break – or you might want to gift – or pop to the shops and gift it to yourself. Nothing wrong with that. Some treats for you, so that you can chill, relax and kick-back over the hols. At the beginning of the year I set my goal of, “Read 60 books in 2017.” I read 57 – not bad right? You see I love to read, like I literally devour books. Some I have given up on this year and others I have read again and again and pick up and refer back to. And the thing is too, it’s only over the last 2 years I have started reading again, because after I had my little boy, AJ, I just couldn’t concentrate. I have no idea why, but for 5 years I didn’t read a single book – I think I might be doing my catching up now! 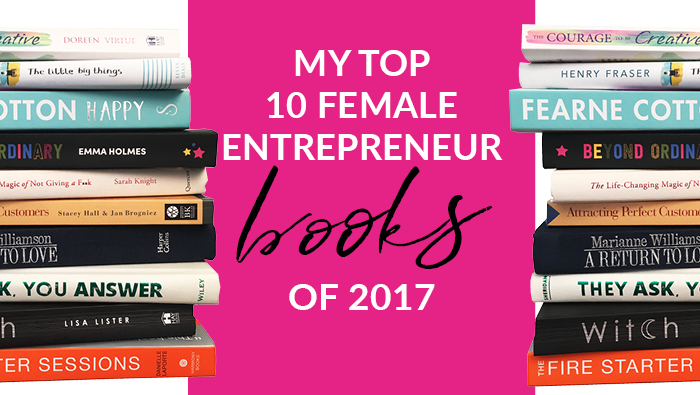 So today I’m sharing with you my top 10 female entrepreneur business books of 2017, ones that have really resonated with me and moved me to take action. What makes us do what we do? Why do we say the things we say? Why did we react to that in that way? Questions you’ve probably asked yourself many times before. In this book, Marianne takes you on a self-discovery journey like no other, it’s like a super simplified ‘A Course in Miracles’. Introducing you to the basic principles but actually explaining it in a really relevant way. If you’ve ever heard of the course itself – it’s pretty hard going. ‘A Course in Miracles’ focuses on “serving humanity through the healing power of forgiving love.” And you’ll be thinking, “how does that help my business?” The entire chapter on Work was a transformational read for me. It’s in this chapter that I started to see how you and your business are one. Switching your thoughts from Sales to Service, and to make creativity the goal not money was so simply explained that it will hook you in. Some of the chapters are a little hard going but overall it will change the way you see yourself and your business, adjust your reactions and make you think a little differently. If it’s a rags to riches and how he did it story you are after then this book is for you. It explains in minute detail just how Marcus Sheridan plucked his failing swimming pool business from financial despair into a thriving, leading pool company. Using a simple method of, did you guess it…. answering people’s questions. Really! That was it – They Ask, You Answer. He started answering customer’s questions, developing heaps of content around those questions on blogs, posts and videos and answering the questions that people don’t answer – often the most difficult ones. In the book it explains how to write and develop content to help you raise your enquiries and convert them into sales. It’s got to be one of the best content books I have read – like ever. From this I have set up an entire content plan for 2018 – I haven’t scheduled or written anything yet – but I know what I am going to write. Off the back of this book too – I wrote a blog post, How much does a logo cost? And it’s the best performing blog on my website. Just following a few simple tips and tricks – it worked! It’s full of practical, what you can do to make it work now advice. You’ll want to go away and write a heap of content once you read this! Now as you will probably already know I work with Emma and have helped her refine her brand over the last few years. And I designed this book cover too. But believe me I am not just saying this as I work with Emma, but this book really is unlike most business books, it’s frank and forthright and if you want a down-to-earth, no nonsense read about how to really be you in your business, how to define your mission, how not to be ordinary, how to set yourself free from boring business concepts, how to stop your self-talk fairy beating you up, how to create your magnetic mission – then THIS book is for you. It’s fascinating from beginning to end. You’ll get heaps of light bulb moments in it – because it pulls apart the normal business processes and quite literally throws them down the toilet. And throughout the book you’ll start to realise that you can be and do and have anything you want from your business by being anything BUT ordinary. Yikes – you might think – Witch – but I’m not a witch – I can tell you now you are. And you most probably have been one all your life. Lisa Lister’s book not only made sense from the first page, but throughout the book, shifts and big changes started to happen in my business. It’s like I grew in size, in knowledge, in understanding and like everything fell into alignment. The book features in-depth explanations on different roots and traditions of witches and you’ll feel a pull towards one – that I know for sure. The whole book is really about empowerment, taking back your power – your divine right – becoming a super power and network of other strong witches and walking your path. Whilst it might all sound a little ‘out there’ and believe me I was unsure of this book at first too, I connected with this book on so many levels and picked up so many much-needed messages. You will learn heaps from this book. If you only ever read one book on witches, make it this one. This book moved me to tears. It’s a book unlike any other I’ve read this year. Honest, moving, deep, thought provoking and inspirational. Those words actually don’t do it justice. After a tragic accident crushing Henry’s spinal cord, he was paralysed from the shoulders down. Henry talks you through his journey of transformation. It’s a truly inspirational book that is unputdownable. Henry talks you through his positive talk process and how it made him who he is today. He really is a remarkable guy and his unshakeable positivity and inner belief in himself shines through the book. His story is a true “anything can be achieved if you believe” story. What Henry goes on to achieve is incredible and he’s a must Like and Follow on social media. I’ll be honest, I’ve heard loads about Danielle LaPorte, seen her planner, visited her website and I still wasn’t sold – until I read this book! Bringing together a whole heap of soulful and practical business advice, Danielle has sprinkled workbook exercises throughout the book to unleash your true inner self, your beliefs, your ideas and asks heaps of questions to get you really scratching your head. It really is releasing that fire in your belly and she shows you how to get there. Presented in a beautiful way the book is scattered with quotes, insights and practical advice on how you really do deserve your tribe, how to do more of what you love and how to be successful on your own terms. If you’re looking for soul in your business and you’re feeling like you’ve lost your way a little, then this book will lead you back on your path. It’ll have you sitting by the fire leaving you with a warm, glowing and overwhelming sense of belonging, comfort and knowing. Visually this book is just a delight. From cover to the very last page, every single page is beautiful. Fearne reveals her biggest demon – depression. Now, I remember Fearne from Fingertips and The Saturday Show wayyyyyy back in the day. She was a bubbly fun-loving giggly girl – unknown to the rest of the nation, off-screen her life wasn’t quite like that. Fearne gives her honest account of her depression. Some of her celebrity biz pal’s accounts of their own battles with depression are also sprinkled through the book. BUT this book really isn’t about depression – it’s about being happy and how to find joy. Rituals, habits, mindset, exercises, hobbies, to dos and simple things in life that lead to a new view on life. The book, like I’ve said, is beautiful from the outset, and sets the tone throughout and even features some of Fearne’s own paintings and creations. I love the time out page – where you literally have to place your phone down and not touch it for a whole hour! There’s heaps of space to write in the book, loads of lovely little tasks and simple exercises to work through as well as writing a letter to your body. It’s a really glorious book and to be honest would also make a wonderful gift too. I also noticed recently Fearne has released a Journal to accompany the book – it’s also beautiful – I did pick it up the other week – it may very well make it onto my shelves very soon! It’s a must have for sure. I laughed at this book no end! It’s a flipping great book. I honestly have never really sweated the small stuff anyway and tend not to get too annoyed by stuff either. So I just had to buy the book! It is very sweary but I swear, believe me I am no angel and I’m no hypocrite either – I see people swearing on their Facebook pages and then moan when someone else swears – it talks about all that sort of stuff! This book really is more of a reassuring book than anything else, that it is ok to really not give a f**k. Things like not giving… that you don’t watch Game of Thrones (nope, me either), that you don’t care about spelling mistakes (life is way too short IMO) and that you don’t have a bikini body (I’m happy with who am I actually). So it kinda throws the rule book out the window and tells you to just embrace yourself and be who you wanna be without inflicting all sorts of rules on yourself – which I love – and I am sure you will too – it’s rules, but bent ones, you can take in to your business too – you’ll become a little different after reading this! If you’re looking for a book that explains how to get customers effortlessly as well as working with the practical elements of the Law of Attraction then you will love this book. It helps you develop a new framework for your business, which is a really unique way of looking at your business and your customers. It will jumpstart your desire to start attracting perfect customers. The book is split into three parts. Part one outlines the Standards of Synchronicity, part two outlines the Strategic Attraction Planning Process and third part the book has 21 tips to really get you into the flow of attracting perfect customers – not just customers – but perfect ones – every single day. I developed three plans whilst doing this book, for different parts of my business, and I read them every day – I have to say they have been mega helpful enabling me to hone in on what works, who to work with and what I know isn’t a good fit for my business. It’s daily work, and committing your time to this will pay dividends. As a creative, and definitely in the beginning, I found it difficult to market myself – and to me, getting paid for what I loved to do was a little alien! In Doreen’s book, she really has capture how creatives think, act and charge for art. Covering how to put yourself out there, how to accept payment for your art, how to listen and tune in to your intuition and really how to stop doubting yourself – all areas that most artists have issues with. I know from a personal perspective I have loads of ideas and get inspired, quite often, by the smallest of things. This book talks about how to stay focused and get really clear on what you want to do and how you will make your dreams a reality. For anyone starting a new creative business I totally recommend this for you – it will spark your fire to really set your creative soul alight and get you creating in your own unique way – a way that feels good and right for you. If you’ve read any books that you think I would find valuable and love to read, let me know. I am always keen to learn. Keen to absorb and always willing to find new ways.